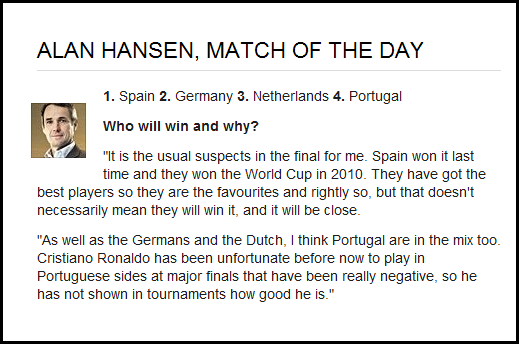 Spotted by our good friends at Who Ate All The Pies, Hansen decided to nominate three teams all in the same group, thus making his prediction of them all making the semis somewhat wrong. The article below it was a list of reasons that Mark Lawrenson thinks will make Belgium win it and below that was a run down of Alan Shearer's favourite sausage rolls he's ever had. Another thing that really annoys me about this is that I'm sure the first line is grammatically incorrect, and if it isn't, it just sounds so horrible to read that someone should have edited it. Then again, maybe I should take this moment to recap some of the sentences I've had to deal with on this site first.